The Peteghem-Prevost design team has created the Lagoon 500, with spacious indoor and outdoor accommodations, high quality finish, and excellent performance under power or sail. 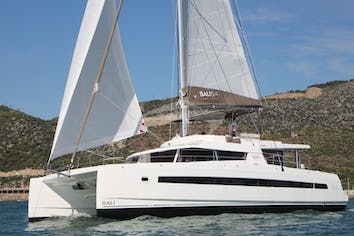 She is fully outfitted with everything needed for comfortable and relaxed cruising of up to 10 guests. Fully air-conditioned, she has a good-size galley with large oven and grill, refrigerator, freezer, plus a dishwasher and additional freezer and refrigerator space. Other features are washer/dryer, electric toilets, ice maker,water maker and an audio visual entertainment system plus internet access. The navigation station on the starboard side of the main salon has a full set of steering and engine controls as well as ample space for charts and electronics. Nikos was born in Greece in 1966. 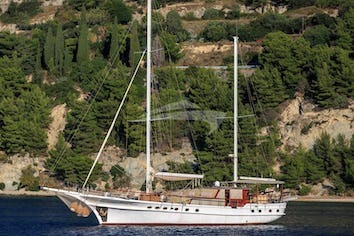 H has worked with Greece's most reputable charter companies over the past decade. He is an extremely well experienced Captain and Engineer, his area of expertise focuses on catamarans. He has sailed the Atlantic, Mediterranean and Adriatic seas extensively. 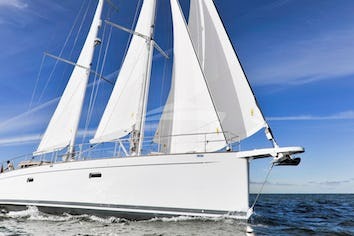 Has perfect experience and the knowledge Yacht Master Ocean 200 GRT for sailing and motor vessels, Greek offshore sailing academy, Powerboat Level II,NAT Diesel Maintenance, Sea survival/Ships Captain Medical/First Aid, Radar Ocean Theory, He is a member of the Royal Yachting Association and the Panhellenic Professional Skipper’s Association. He works in Brama Yachts & Catamarans the last 10 years. His interests include Sailing, Travelling and windsurfing. He speaks Greek, English and Finnish fluently, has an outgoing personality and always a great disposition. Daniela was born in Italy in 1971. She has over 15 years of experience as a cook/hostess onboard charter yachts. For the last 10 years she has been working exclusively for Brama Yachts and Catamarans. She has a skippers and motor yacht license. Daniela enjoys discovering new foods and variations. She will surprise and delight you with her Greek & Mediterranean menus. She is extremely organized, optimistic, flexible and has a pleasant personality. She speaks Greek, English, French, Turkish and Italian. Daniela has great sailing experience also. Fried or scrambled eggs, pancakes, cereal,chia seed pudding with summer fruits, fruit salad,variation of toasts. Lunch or dinner: creamy chicken risotto with vegetables, pasta carbonara,meat balls in tomato sauce,raw zucchini pesto spaghetti,baked BBQ ribs.